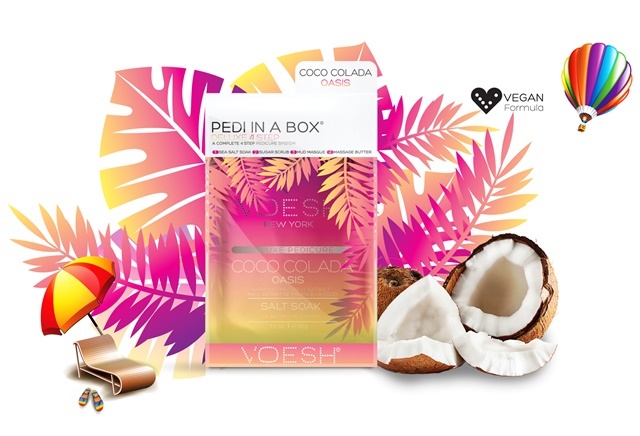 Voesh's Pedi In A Box is now available in Coco Colada Oasis, a tropical scent that's perfect for your spring and summer services. The product is made with rich, creamy coconut extract that restores moisture and revives dry skin, keeping it fresh and soft. The pedicure service will relax senses with happy, exotic notes, leaving clients feeling as though they are on a vacation. The vegan, organic formula includes sea salt soak, sugar scrub, mud mask, and massage cream. The packages are single serve, perfectly portioned, and easy to use. For more information, visit www.voesh.com.